Elephant's Ear is one of the best survival foods in the world because it is hardy, all parts can be used and it can be harvested at any time of the year. It originated in Southeast Asia and is now grown as a crop all over the world. Elephant's Ear is believed to be introduced to southern Africa by Portuguese traders before 1500 - today the starch-rich corms are staple diet in many parts of southern Africa. 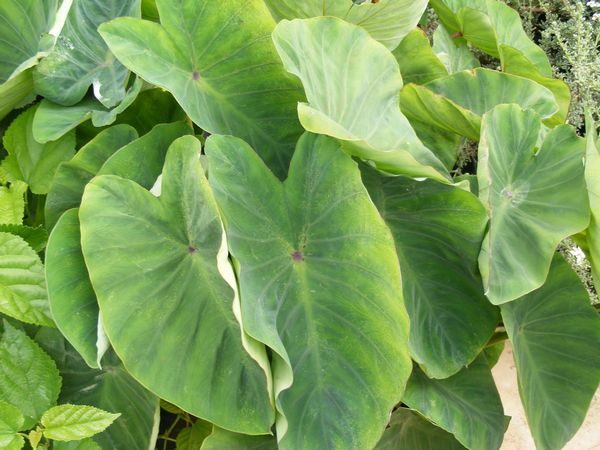 Elephant's Ear is a robust perennial plant with a large corm on or just below the ground surface and it has very large, heart-shaped leaves that are borne on thick stalks. It can be grown in large containers or outside in the ground all year-round in subtropical and tropical areas. They also grow in temperature region where the summers are hot. There they are planted out for the summer and the corms are dug up and stored over winter - dry and with ventilation to prevent fungal infection. Plant the root tuber close to the surface - the first signs of growth will appear in 1 to 3 weeks. They need sun or shade and spacing in-between must be at least 1.2m to allow optimum growth - it will mature after 5-10 months. It grows well in moist heavy soils but will also do reasonably well in any soil provided it is moisture-retentive. Elephant's ear should not be left to go dry for too long and periodic fertilization (every 3 to 4 weeks) with a common plant fertilizer will increase yields. It can also be grown as an aquatic plant. The primary use of Elephant's ear is the consumption of its edible corm and leaves. In its raw form, the plant contains an irritant which causes intense acridity discomfort to the lips, mouth and throat. This is due to the presence of calcium oxalate and microscopic needle-shaped raphides in the plant cells. Thus, both the leaves (of which the veins should be carefully removed) and the corms (skin removed and steeped in cold water overnight) must be well-cooked before eating. Provided that the above precautions are taken, all parts of the plant are edible & delicious. After pre-boiling the leaves and stalks, they can be mixed with other ingredients and be cooked into curries, soups, stir fries & casseroles. The stems provide a nice texture to any dish. The corms can be added to the same hot dishes - but they are also excellent on their own as a roast/ boiled vegetable or cut into chips. Cooked corms are also commonly used in desserts. The whole plant - corms, leaves and stalks. Macerated leaves can be used as a poultice on infected sores. To treat insect stings, the stem leaf can be cut and rubbed on the affected area to prevent swelling and pain. The young leaves are rich in vitamin C and thiamine (vitamin B1), riboflavin (vitamin B2) and niacin. The tubers contain amino acids and are rich in starch.